Former United States Ambassador, Governor Mr. Bill Richardson has resigned from the advisory board, which was set up to counsel on enacting the findings of the previous commission headed by Former Secretary General Mr. Kofi Anan. He has quitted from the Board after thoroughly examining the true temperament of the board chairperson Mr. Surakiart Sathirathai, former deputy prime Minister of Thailand, and also having harsh conversation with State Counsellor, Daw Aung San Suu Kyi due to two Reuter reporters’ release, mass Rohingyas killing investigation course of action and citizenship of Rohingyas people. Mr. Bill felt the board chairperson Surakiart will follow up the secret direction of Daw Aung San Suu Kyi, who desires the worldviews on oppressed Rohingyas should be false and the advisory board will conquer the world current accusations on Daw Aung San Suu Kyi and her alliance Military commander Min Aung Hlaing as BUTCHERS against Rohingyas innocent’s massacre. The atrocities committed on ROHINGYAS by Myanmar forces and shielding the horrendous crimes committed by the forces on helpless Rohingyas by Daw Suu Kyi has been unanimously recognized by the UN as “textbook examples of ethnic cleaning”. Since 1993-94, there was UNHCR (the United Nations High Commissioner for Refugees) agency and other small NGOs in north Rakhine state to carry out the need of Rohingya people after those having information of oppressed Rohingyas in the hand of Myanmar military regimes. The then UNHCR’s cooperation & efforts with leaders of Myanmar military regime was somehow notable, reaching a temporary agreement with dictator Gen. KHIN NYUNT to grant Rohingyas people either NRC or National Scrutiny Pink Cards to the people of document-less Rohingyas. In accord the fragile agreement of UNHCR with Myanmar government, the then military governments have provided at first TRC (temporary registration Cards, as first step ahead to become citizens) which is meant neither as foreigners nor Citizens of Myanmar though all those later TRCs receivers have been the offspring of their fathers, grandfathers, and great grandfathers as Myanmar indigenous citizens. Who all possessed in their hands the National Registration Cards, arranged by the first democratic government after independence in 1948. But these TRCs were never ever promoted into NRCs as per the initial agreement struck with UNHCR by Myanmar military governments. Myanmar authorities to make documents less due to the entire Rohingyas from the status of citizens of Myanmar, all Rohingyas in their localities were being pressured by the authorities to return either their NRCs papers to the authorities or face punishments those who did not return back in time. During the periods, the concerning authorities would arrange the limited permits for TRCs holders to travel from one place to another on purposes of education, small local trades and medical treatments but with having prior travel permits from the relevant villages/quarters’ heads, which cost a big money and time eating for possible Rohingyas travelers. Rohingyas in localities believe the authorities’ pressure to returning the NRCs or unavoidably holding the TRCs is the state PLOT to make Rohingyas as wholesale FRC, who as if sneaked from Bangladesh into the enclave as Dr. Aye Chan, Rakhine academicians in local and abroad and entire Rakhine politicians’ exaggerated propagations to the regimes of Myanmar time and again. Some NRCs holding Rohingyas having been worried to becoming documents-less, those NRCs cards holders would shun the authorities as much possible as they could to returning. As the NRCs were found along the road during traveling, the NRCs would have been captured and cut with succors into pieces as trash by authorities and some officers would destroy haughtily & throw it to mud not to be useful again. Fortunately, of course, yet there are NRCs holders who neither need to show the authorities along the ways whilst they do not travel from their locations to others but stay at their homes. Their NRCs are exempted from the destruction of Myanmar authorities because they become old-aged senior people who have retired from travel related works. Rohingyas from Rakhine state have never been the foreigners nor temporary citizens as per the citizenship law of Myanmar instead they were rightfully handed the National Registration Cards together with other ethnic groups of the nations since the nation-wide citizenship issuance was initiated by the first democratic government at the dawn of independence. The world most high-ranking officials from the stage of The United Nations platform would always insist the past Myanmar military regimes, and the current Daw Suu Kyi led democratic government to respect the human rights of Rohingyas people in the regions. And, those world dignitaries have been rightfully suggesting to be granting the Rohingyas as the citizens of the state in accord the inspiration of the first democratic government of Myanmar, as well as by the Universal Human rights laws. The regional, the world community, and that of the renowned leaders have had a LOFTY hope on Daw Aung San Suu Kyi, who become right now the bigoted democratic regime leader, at least will change the entrenched delusion of the past military governments as the person. Whom the world loved and recognized her intelligence and all her academic works at large. Daw Aung San Suu Kyi is the one who attaches importance to Rakhine nationalists’ narratives from the beginning and has been ignoring the reality of Rohingyas existence. In fact, Rakhine are, so much embolden nationalistic people, and entire Rakhine have unanimously coordinated to expel both Rohingyas and Burmese people, whom Rakhine believe Rohingyas as infiltrators to grab their lands and to Burmese as cruel executioners. Vet. Aye Maung, chairperson of ALD is the parable to be aware of the motivation of entire Rakhine. As per the world historical records and renowned academicians’ perceptions, Mr. Anan final report of advisory Commission on Rakhine State stated; “Rakhine state_ separated from the rest of Myanmar by a rocky chain of mountain_ has for most of its history been a diverse political entity. While, there are records of independent kingdoms since ANTIQUITY. The final Rakhine Kingdom was established in 1430”. There the independent kingdoms since ancient times belongs to nowadays Rohingyas people (In ancient time, today’s Rohingyas were Hindu believers and after 1202, they gradually converted their belief into Islam) and the final Rakhine Kingdom was established in 1430 was mentioned to RAKHINE existence, presumably. During 1942 pogrom, which has been taken advantages by Rakhine nationalist U Kyaw Khine, the then Vice - Commissioner of British Arakan, and there was neither British Power nor Japanese forces, U Kyaw Khine has supplied arms to Maugh Rakhines and those have killed many innocent Rohingyas particularly in South & Central Arakan, and more than (307) Rohingyas villages from nine townships of central Rakhine state were burned down, which has resulted to abandon their homes, properties, and villages to flee to north Arakan? 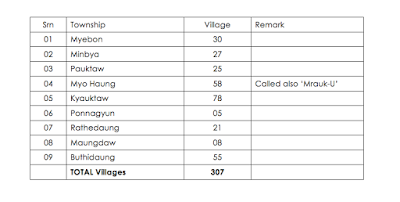 To share more information, do find Rohingyas villages to which Rakhine fanatic have burned down in 1942 pogrom and push guiltless Rohingyas to flee to north Arakan: Rathedaung, Maungdaw, Sittwe and Buthidaung townships. 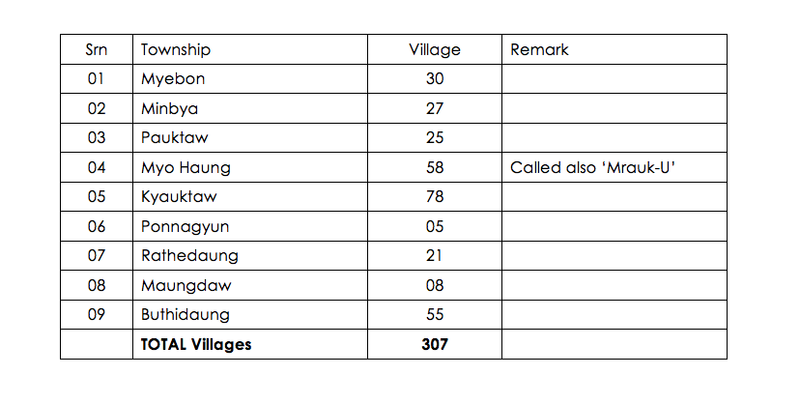 Since 1942 to now, within 74-year, Rakhine Buddhists, Myanmar military, and the current democratic government have already burned (687) villages throughout Rakhine state, it included recently torched nearly 380 Rohingyas villages from north Rakhine state: Maung Daw, Rathedaung, Buthidaung townships. Because of mass exodus of Rohingyas who escaping from the execution of Rakhine nationalists from central Rakhine state to north, since then, the north Arakan becomes as densely populated areas because of displaced Rohingyas driven by Rakhine fanatics from central Rakhine. In this connection, to cover up Rakhine vicious executions and collective criminality on innocent Rohingyas in the pogrom in 1942, Rakhine people have been pointing out “the densely populated of north Arakan by the sneakers of neighboring Bangladesh as ‘green pasture seekers’ while Bangladesh itself is poor and heavy population in the country”. They, Rakhine always adhere to this EXCUSE. In this way, both Rakhine Mough Buddhists and Myanmar governments have been targeting the Rohingyas to formulate as aliens, sneakers, and immigrants to work in agro-farms from Bangladesh after British occupation in 1824. In accord 1982 citizenship law, the central government would have been trying to figure the indigenous Rohingyas people as foreigners, naturalized and associated citizens by disenfranchising all due rights which they have once rightfully deserved after independence as full fledge citizens. The government wants Rohingyas to alter from the full fledge citizens to disenfranchised, naturalized and associated citizens. What is the horrible mindset of the democratic government of Myanmar regarding Rohingyas? Throughout the periods, Myanmar officials and immigration departments would find out loopholes and dragging the cases to render the NRC / Pink cards, in time, to Rohingyas, reasoning this and that too much irrationality without much consideration. Does the government of Myanmar want the documents-less nowadays’ Rohingyas generations as “naturalized, associated citizens” while their fathers, grandfathers, and great grandfathers have been the citizens of Myanmar with legal documents of the nation of Myanmar as per the 1947 constitution that drafted before independence? All Rohingyas are legally deserved full citizenship while no single Rohingya is found as foreigner in the enclave apart from some exceptional. The Border Guard Police (BGP) formation has been the special program of the consecutive regimes to protect so-called Bangladeshi sneakers from entering into Myanmar territory. Actually, no single Bangladeshi has ever been heard arrested who tried to enter into Myanmar but there would have been the Rohingyas people who might enter to his/her country after having earnings for their families in abroad as entrants to localities. This is real & undeniable. For the last two and half decades, almost all Myanmar’s people both capable male and female would have been secretly going out without proper documents to Malaysia, Thailand, China, India, and Bangladesh, particularly to where there would have been a little bit more earning sources which have been better places than Myanmar for every family’s dire survival. Most importantly, Malaysia is the first target to reach whatever-ways whether by mountain passes or sea and the second choice has been Thailand. There would not be a single family in Myanmar that there have not been to Malaysia to escape the hard life or overcome starvation in Myanmar either with legal documents or without. Likewise, Rohingyas people went out to earn for their families’ survivals like other people of the country. What is wrong! While the white cards were temporarily issued under the sponsorship of UNHCR and the then Myanmar successive governments two decades ago, Rohingyas were never issued the PINK Cards though they have been holding WCs up to more than two decades, instead these WCs holders were again broadly issued the NVC cards instead of PINK cards. Reasoning, the government’s scrutiny plan has not been completed. What is this ‘cheating-spiraling’ citizenship processing of Myanmar’s current government on Rohingyas again? Though, national verification process was supposed by Mr. Kofi Anan mission before granting Rohingyas the National Scrutiny Cards. Majority of Rohingyas people believe “this government character is as the same as previous governments against Rohingyas and the current regime will take steps like previous to keep Rohingyas in the situation of NVCs holders for many years ahead and they will be ruthlessly restricted all due national rights”. Let’s think over how much Rohingyas people would suffer against the multiple discriminatory policies of the authorities and scale of Rohingyas’ frustration they have been suffering in their hearts while all the related affairs of a person in a daily life is simply inter-attached with ID of the nation before simply & easily branding them as terrorists on innocent fellow beings. If the advisory board, which is consisted of local and foreigners as the advisors to Kofi Anan report, is under the direction of scoundrel Daw Aung San Suu Kyi, who wants to humiliate Rohingyas and deceive the world continually. Then there will be no fruitful result for advisory board’s tireless efforts, and ultimately they will encounter with the world in unprecedented embarrassment and the BOARD will become failure in the end. Because, the previous locally invented several investigation teams since 2012 have not discovered any wrongdoings of the government to take actions on THEIN SEIN’s government though there have been with a number of approved documents regarding colorful nightmares that ensued on Rohingyas by the government forces and Rakhine militiamen in the occurrences in Sittwe, KyaukPhyu, Kyauktaw, Myebon and Kyauk-Ni-Maw. All the enquiry commissions that were formed regarding Rakhine state of Rohingyas affairs without a single person of distinguished Rohingyas by the previous and current regime of Myanmar whether the board members are local renowned intellectuals or foreign fellow scholars, they are merely the head bowers or lackeys on behalf of Daw Aung San Suu Kyi, and all the consecutive investigation board members including currently are nothing more than “the same alcohol from different bottles”.